On Friday 13th - Sunday 15th February there will be a special exhibition of Ralph Steadman portraits of the main characters in Breaking Bad, due to be featured on a new set of Blu-rays. It's on for 3 days only in Leonard Street, EC2 - get to see these very special takes on the Breaking Bad world, plus other character portraits from new British artists. 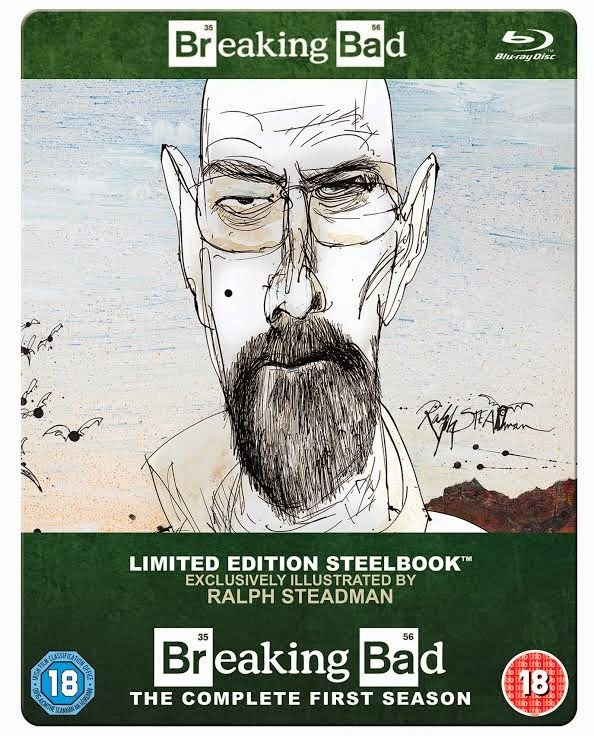 "Join us at 71a to celebrate the release of the Breaking Bad Limited Edition Blu-ray Steelbooks, featuring exclusive hand-crafted character illustrations by legendary British cartoonist Ralph Steadman. Also displayed will be a selection of original artwork inspired by Breaking Bad from UK rising talent personally chosen by Ralph Steadman. WALTER WHITE: "The characters are specific, primarily Water White appeared to be an intensely honourable family man who during the course of the story, became indelibly corrupted." JESSE PINKMAN: "I thought Jesse was going to turn out to be a waster and in fact, he developed instead into an incredibly compassionate human being." HANK SCHRADER: "The warmth of friendship between Hank and Walt was both touching and tragic, and I wanted to take both Hank and Walt and get them to realise each others' points of view. I constantly wanted to shake them and tell them 'pull yourselves together and work this thing out.'" SKYLER WHITE & MARIE SCHRADER: "As for the wives, sisters Skyler and Marie, there was something about them that at first seemed so foolishly unaware of what was happening, that it couldn't possibly happen that way." THE WHITE FAMILY: "Regarding baby Holly, Skyler and Walt seemed rather too old to be starting a new family, although early on in the series, there was obviously strong affection between both of them. A dimension of the family was the beautiful adoring son, Walt Jr., who at first simply would not believe there was anything wrong with his beloved dad, and then discovered that all that glitters is not gold." SAUL GOODMAN: "I loved the lawyer. He was so wonderfully crooked.""